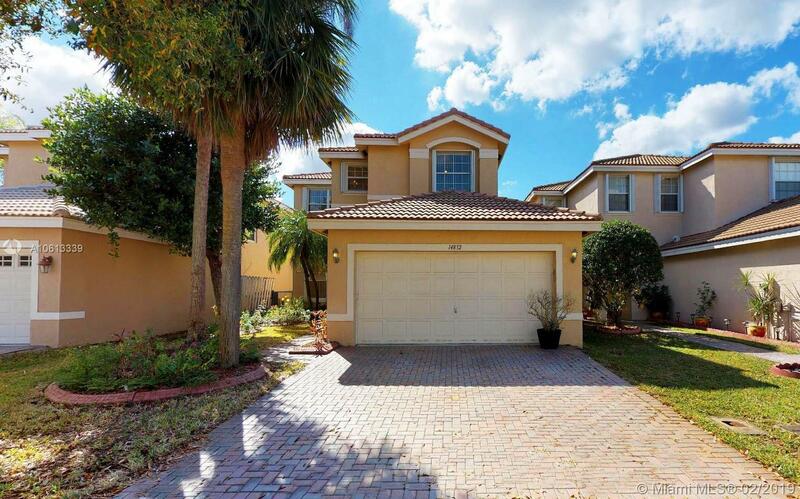 GORGEOUS TWO STORY HOME IN THE BEAUTIFUL SILVER SHORES GATED COMMUNITY WITH THOUSANDS OF DOLLARS IN UPGRADES/RENOVATIONS. THIS IMPRESSIVE HOME FEATURES A BRAND NEW KITCHEN WITH WOOD CABINETS, STAINLESS STEEL APPLIANCES AND QUARTZ COUNTERTOP AND BACKSPLASH,COUNTER ON AN ISLAND SETTING FOR A SEAMLESS LOOK/OPEN CONCEPT, SEPARATE DINING AREA, LIVING ROOM PLUS FAMILY ROOM. HUGE MASTER BEDROOM WITH TWO LARGE WALK IN CLOSETS, LAMINATE FLOORS ON SECOND FLOOR AND PART OF THE FIRST FLOOR. ONE BEDROOM WITH A WALK IN CLOSET AND FULL BATHROOM ON FIRST FLOOR. TWO CAR GARAGE, PRIVATE FENCED PATIO, ICE COLD A/C, EXCELLENT LOCATION! !DONâT MISS THIS ONE!! !WILL NOT LAST!! MAKE SURE TO CHECK OUT THE 3D TOUR AND VIDEO!!! Directions: I-75 To Miramar Pkwy West, North On Dykes, East On Pembroke Road, Entrance Of Silver Shores On Right.